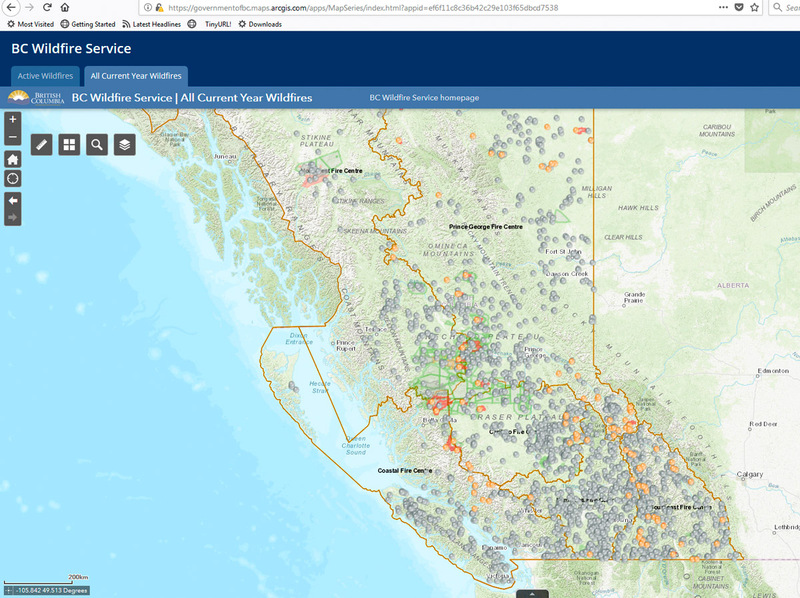 Record numbers of forest fires raged throughout BC in the summers of 2017 and 2018. Last year, many routes in and out of the interior of the province were closed; one quarter of the population of the Cariboo and Chilcotin regions had to evacuate their homes. This year, the government declared a state of emergency. Although there were two fires more than 100 hectares in size as close as 14 km northwest of Wells, we were fortunate that they did not come our way. Map of all of this year’s fires. The fires caused major human, animal, environmental and economic upheaval. Our summer gallery sales were at their lowest in close to 23 years due to the reduced number of visitors and the cancellation of a major event. The tension took a toll on everyone. But there was a terrible beauty in some of the photographs that documented these fires, and the colour palettes in some of the images that our friend Chris Harris created, as well as a serendipitous monoprint test, inspired me to print two small editions with variations in colour. Silkscreen monoprint with a warm colour palette and gold ink texture. While setting up a miniature Northern Lights print (see below), I came across an old test print with an orange background and a warm, streaky rectangle on top, with a gold texture overlay. When I tested my dark green-black ink for the black spruce silhouette image on top of these colours, instead of on top of a glowing night sky, I immediately saw the potential for a fire print. I created two new stencils for tree silhouettes in landscape and vertical formats in order to explore more composition options. By loading several distinct ink colours onto the screen every few prints, I was able to generate a range of backgrounds of fiery, smokey skies. Then I printed a wrinkly gold texture on top that faded out to clear at the bottom, and finally, the trees. Printing “Wildfire I” and “Wildfire II” was a very exciting process. I’ve also enjoyed the responses of visitors, many of whom have had their own wild fire stories to tell. All are all 10 x 15 cm = 4 x 6 inches. When I was growing up, my family had a coastal seascape painting by Irving Sinclair with a black light mounted above it. At night, we’d switch on the light and the moon and stars would glow, as well as some of the wave crests crashing into the shore! I was fascinated and spent hours looking at the way Sinclair applied paint to canvas, used light, shadow, and tonality. He gave me some oil paint on an old palette once so I could fool around with the colours. I still remember the smell and the texture. 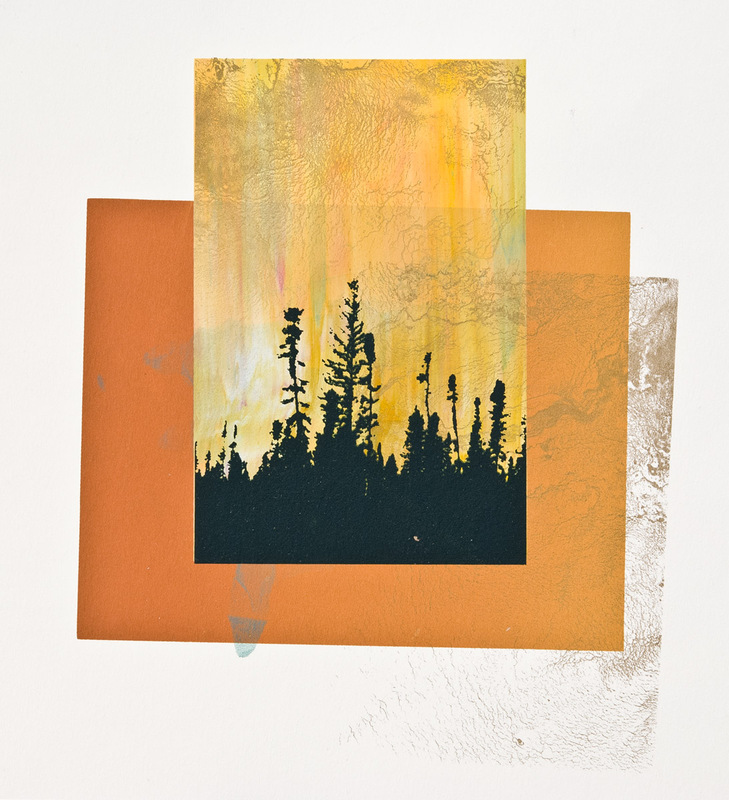 “Black Spruce Aurora I”, silkscreen, 13.5 × 21.5 cm (5.25 × 8.125 in), © Bill Horne 2017. “Black Spruce Aurora II”, silkscreen, 44 × 33.5 cm (17.5 × 13.25 in), © Bill Horne 2017. Source image: Hay River, NWT, 2011. Glow powder mixed into water based silkscreen ink clear base. Glow-in-the-dark silkscreen ink with the lights out. Hand cut rubylith film positive for background sky stencil; screen in register. Prints drying on the rack. Prints with black spruce on top of glow-in-the-dark ink drying on print rack. Print drying on rack in dark. Every two years I enjoy the challenge of working within the constraints of the Biennial International Miniature Print Exhibition (BIMPE): a maximum print size of 10 x 15 cm (4 x 6 inches). Silhouettes of the black spruce trees of Canada’s boreal forest continue to fascinate me, so I thought I’d print some miniatures to continue my northern lights series (see the Landscape Prints tab on this site). To create a sense of the electrical nature of the aurora, fleeting night clouds and shifting light, I used two film positives made with a wrinkly, textured photocopy toner wash. Looks like a classic tusche wash texture from a stone lithograph! Toner wash texture printed in gold ink on top of a gradient. Toner wash texture printed in silver ink on top of a gradient. silkscreen with glow-in-the-dark ink; horizontal variant. Silkscreen with glow-in-the-dark & gold ink; horizontal variant.